Based on six stories from Stuart J. Murphy's popular award-winning MathStart series, playwright Scott ("Schoolhouse Rock Live!") Ferguson has crafted an original story of adventure, mystery, friendship and...math! "Math Skills are Life Skills!" says the sign on the wall of the Main Street Kids' Club clubhouse. They are lots-of-fun skills, too. From 100 Days of Cool (numbers 1 to 100) to Treasure Map (mapping) and an unscripted audience participation game of "More or Less" (comparing numbers), The Main Street Kids' Club gets kids tapping their toes and cheering. They will root for Perry the Penguin, who learns all about negative numbers while trying to save up some clams for a shiny new ice scooter. He's a whole waddle of fun! They will travel into space with Captain Invincible and his trusty pooch, Comet, navigating a meteor shower and warding off a galactic beast while learning about three dimensional shapes. And they will be humming composer Jeff award-winner, composer Michael Mahler's Lemonade for Sale tune as the they leave the theater, budding entrepreneurs ready for some serious bar-graphing. "MathStart books are all about teaching math skills in the context of stories. But I had to wonder how that was going to covert into a staged musical for kids. Well it converted very well indeed! The math is there. The math skills are reinforced. It's all part of one cohesive story—an exciting story—that I think will get kids' attention. The whole notion of a musical about math for children is really an exciting idea." Or, as one second grader put it, "It's rad!" 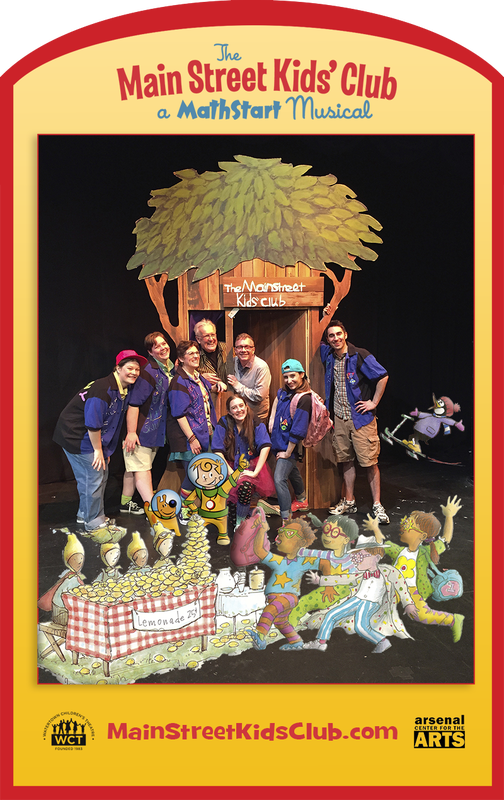 Bring a production of The Main Street Kids' Club to your community theatre or school today! What's it like to bring a production to your theatre? Click to find out!